Part of a cruise itinerary from Sydney to Singapore which BTN has partially covered in previous issues, sadly the operator got it all wrong. Queensland is nicely spoilt for tourist attractions. Firstly there is the Reef, secondly the heritage and ecological sites within easy reach of the coastal towns, and thirdly the glorious beaches. Our first stop once leaving Brisbane and going north was Airlie Beach (tender), also confusingly called “The Whitsundays” a holiday township. We worked out for ourselves that the Reef was not practical with something less than eight hours available. We took the open top bus tour whilst other went off on a crocodile safari or snorkelled in the clear blue sea. The village itself is only a short walk from the jetty. Next anchoring, this time overnight, was Cairns, the centre of the Reef industry and the one available quay taken by another cruise ship.. We moored at Yorkey’s Knob outside the town but convenient for the Skyrail Rainforest Cableway, a highlight of the whole trip. But first The Great Barrier Reef. In the centre of Cairns is the Reef Fleet Terminal with a selection of tours and offerings. We took a Green Island package, 45 minutes by catamaran with up to three hours on the island and a choice of a glass bottom boat trip or the use of snorkel equipment. Also available was “Seawalker” an underwater walk on the sea bed with the fish and coral all around you. A unique experience. We managed a swim in the Coral Sea, and a mile-long beach stroll around the whole island. The Green Island Resort hotel is upmarket and exclusive. The island helipad offers scenic tours and a transport service. Green Island, discovered by Captain Cook in 1770 is not named because of its lush rain forest, but after Charles Green, the astronomer on board HMS Endeavour. It is also the home of Cassius, claimed to be the largest crocodile in captivity. Scuba diving instruction is carried out in a swimming pool which is also open to visitors. There is a restaurant and snack bars. 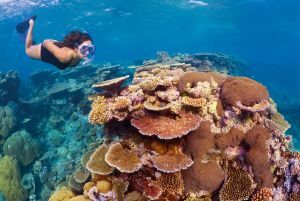 To give readers an indication of where a large number of the two million visitors a year to The Reef area come from, Cairns has a Shangri La resort hotel. Next stop the Rainforest Cableway, a 7.5 km scenic cableway running above the Barron Gorge National Park. It was the longest gondola cableway in the world when completed in 1995. The 34 towers supporting the cables were all lifted into position by helicopter. 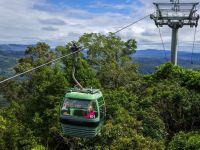 Each gondola can carry up to six people and the ride, including stopovers at Red Peak Station (free guided tours and a 180m walkway through the forest) and Barron Falls (for fantastic views) We took it up from the Smithfield Terminal, not far from Yorkeys Knob, to Kuranda, in the heart of the Barron Gorge National Park. This tiny village (population 3,000) dates from the 1880s with an idea to build a railway from Cairns to bring tourists into the rainforest with ease. Passenger services began operations on 25 June 1891. It was once a sort of Australian hippy colony but things have now moved on and it is today a tourist attraction in an exceptional setting. The railway is 37km (23miles) in length. Either way the train takes 1hour 45 minutes. The village is about 1,000ft above sea level. The Skyrail and train station are next door to each other and it is a short walk into the village where there is a zoo, markets, art galleries and ethnic Aboriginal crafts. In the zoo, there is the option to hold a koala and feed kangaroos, a true Australian experience. The train station features a small café wi-fi connected to take your credit card. Be careful with your timings as the services are limited to twice daily. As the train travelled down, a detailed and informative commentary of the railway's construction was provided noting the Stony Creek Falls Bridge standing on three trestle piles with a very tight radius. In days of yore Cairns was an important rail centre but in the 21st century all that is left is the Brisbane based Spirit of Queensland five times per week and the Kuranda service twice daily, also stopping at Freshwater in the Cairn suburbs. The good news about Cairns station is that it is in the centre of the city and integrated with a shopping mall. Within a short distance is the Cairns Museum, recently renovated and very much updated in the School of Arts building and telling the history of the area from aboriginal times, through the history of sugar, World War II, and of cyclones and the weather. For more on the Great Barrier Reef you can watch David Attenborough online or on TV but it is not the same as the experience.